Wouldn't you like an easier way to make a statement in a quiet, dignified way and spark a conversation at the same time? The Great Gatsby is one of the most widely recognized books in American literature and is sure to turn heads. Evocative of sorrow and excess, you see the iconic sad eyes and bright red lips adrift in the deep blue night sky, hovering ominously above a skyline that glows like a carnival. The vividness of the colors are sure to pop the simplest wardrobe staples. HANDMADE IN THE USA. 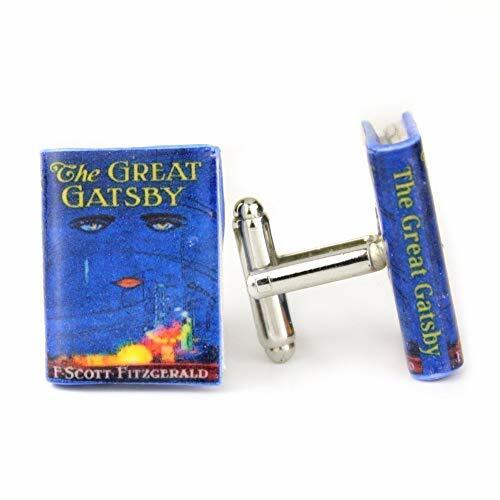 When you invest in these cufflinks you start a collection with a designer, who is a product of generations of book lovers and craftsmen dedicated to producing the finest wearable books for you. Get yours today, because once you have it, you'll no longer have to deal with unsightly flapping cuffs. If you have any questions about this product by Book Beads, contact us by completing and submitting the form below. If you are looking for a specif part number, please include it with your message.